Front row (left to right): 1. J. Van Loucks, 2. Robert Guthrie, 3. Stella G., 4. Louis Dentici, 5. Jack Nickerson, 6. T. Loyola, 7. Juleda Favilla, 8. Betty Isernhagen. Second row: 1. B. Harman, 2. S. Crist, 3. Marie Roggi, 4. Virgil Bretz, 5. D. Sanders, 6. Richard Greeno, 7. Donivon Hailey, 8. Shirley Granna. Third row: 1. Mrs. Vera Crane (teacher), 2. Skeeter ?, 3. Russell Rassmussen, 4. Louis G., 5. Evagene Grosser, 6. Veldon Rodgers, 7. Beverly Sandell, 8. Chester Thompson. Fourth row: 1. Dorothy Maples, 2. Wayne Avilla, 3. Leslie V., 4. Shirley Armstrong, 5. H. Westerman, 6. Sylvia Hughes. Credits: From the collection of Sylvia M. Hughes Pilcher. 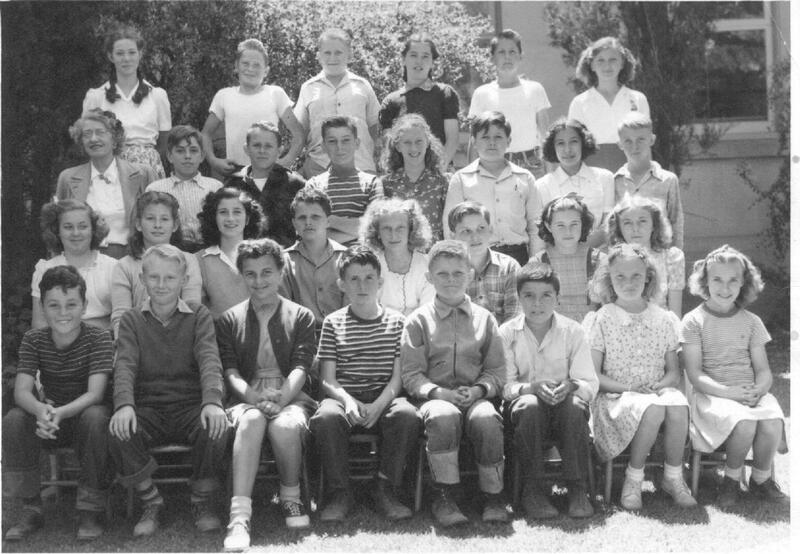 Thanks to Sylvia M. Hughes Pilcher and Richard L. Greeno for identifying the kids in this picture.